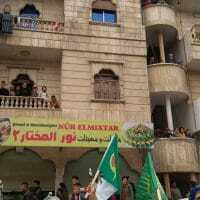 We had arrived two days ago to Afrin after a three-day trip in the bus. We sat sipping tea on the cushions spread around the room, in a home packed with more than 35 displaced Yazidi women and men from the occupied villages. In the faces of silent women and small children we witnessed a quiet concern. They were surprised by our sudden, late-night visit and there was a palpable sense fear: here, in the battle here in Afrin, they were all alone. They were curious about the thoughts and feelings of the Lebanese. “Do they know what is really going on happening in and around northern Syria?” “Do they consider the Takfiri/Turkish attack an occupation?” In a way, I think, they were asking whether other Arabs perceived them as friends or foes. The questions they raised were not just about the peoples of the region, and their connections with the Kurds, however. They were also concerned about the role of Americans, Russians, Turks and the Syrian army in what has occurred for the past few months in Afrin. Afrin fell in just four hours. The reason for the swift fall was not because fighters fled, as rumored in racist anti-Kurdish circles. 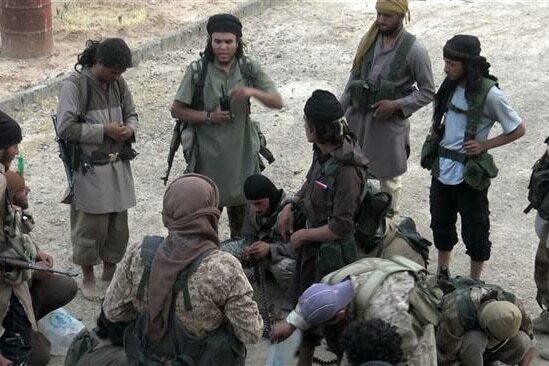 Its swiftness was because an army of Takfiris (Turkish mercenaries), advancing under the cover of Turkish aerial bombing, and with the support of some 37,000 Turkish ground troops—and indeed with the political consent of the Russians—was able to defeat, even if only temporarily, groups of several hundred lightly armed female and male fighters. In the last week, perhaps 250 villages and towns were occupied. This was not because they were undefended, but because there is a difference in political power and military strength between the resistance and the occupation. Contrary to what has often been said, which is that the popular Kurdish units had refused the Syrian army’s repeated requests to enter the city on the condition (put by the Syrian army itself) that the Kurdish forces surrender their ‘heavy’ weapons and posts, an argument which those who wish to blame the Kurds, and not simply the protection forces, for losing their own city, we know otherwise from regional correspondents. The accusations of “intransigence” on the part of the (Yekîneyên Parastina Gel, People’s Defense Unit) the Kurdish forces, is simply incorrect. In fact, it seems clear that the protection forces and the Syrian Arab Army (SAA) had agreed that the SAA could enter Afrin and defend it, with the agreement that the loss of Afrin is not acceptable. Furthermore, we have confirmed information about the participation of fighters from the villages of Nubbol and Zahraa, who helped resist the Takfiri/Turkish occupation, without the knowledge or consent of the Russians. Thus, it is worth focusing on two main players—the Russians and the Americans. In this affair, the Russians saw an opportunity to create good ties with the Turks and at the same time weaken the hostile NATO bloc amassing against Russia. The U.S. response was simply to fully support the Turks and leave their new allies, the , to die under Turkish airstrikes. Moreover, the Lebanese leftist newspaper, Al-Akhbar, quoted the Turkish presidential spokesman saying, “His country will establish a ‘safe zone’ with the United States around the city of Manbij in northern Syria.” Thus, we seem to be in front of several different scenarios. The most likely, and the most feared, is a Takfiri/Turkish occupation of Aleppo. This would create the only viable possibility for rescuing in Idlib. It would also lead to the occupation of the Syrian northwest, and thereupon lead to a corridor tying it to the U.S.-occupied zone by expanding into Manbij. Given the strong U.S presence in Syria, with its 9 military bases “East of the Euphrates,” it would then find support from the Takfiri/Turkish friends in the northwest. In effect, Syria would become three Syrias. But it is also useful, and crucial, to look at the U.S. occupier’s influence through its new alliance with the Kurds. We speak clearly against the McArthyite discourse against the Kurds. However, it is necessary to examine the perils of alliance with the U.S., occupier of the largest Syrian territory. The new entente with the U.S. has not only its translation in military form, but also in political terms. We are witnessing in front of our eyes the shifting of position of a Marxist political party (PKK) vis-à-vis the U.S. Curiously, in the eyes of the PKK the latter is becoming a “friend,” where previously it was enemy of the people, spearhead of capitalism: the imperialist state par excellence. It is this simple, and it is this dangerous. Trench on the northern border of Afrin (March 7, 2018). 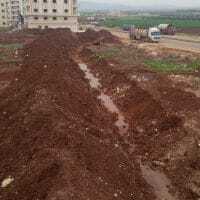 Trenches on the borders of Afrin (March 8, 2018). 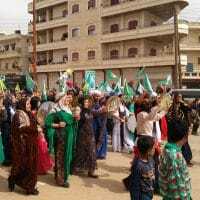 Women’s demonstration in Afrin (March 8, 2018). Refugees watching women’s demonstration be from their balconies (March 8, 2018). 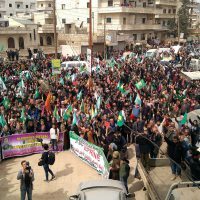 Womens demonstration at courtyard in Afrin (March 8, 2018). It is indispensable for us, as Arabs, to understand that a with the Kurds—and thus the social, political, cultural inclusion of the Kurds in this region, as an enemy of imperialism, as an integral component of the region—is not an easy task: but it is undoubtedly a necessary one. Years of persecution, racism and exclusion has produced a Kurdish alliance with the occupier, which some call “inevitable.” It is necessary to understand that the Kurds today look at the Takfiris as “Arabs.” They in turn translate their enmity into a hatred of all Arab peoples. 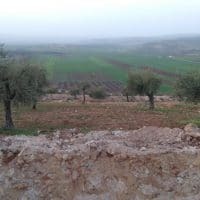 For two days after the occupation of Afrin, the pictures and videos flowed from the media of people streaming out of Afrin’s only exit, the only crossing point to leave the city. More than 150,000 people climbed the mountain in cars and by foot. Many of them died in this new journey, a new exodus, a new departure for the peoples of Syria—one towards the unknown. Yesterday, we heard news of Takfiris climbing that same mountain. Locally, it is called the “Mountain of Dreams,” separating Nebbol, Zahra and Aleppo, from all the nightmares. Jana Nakhal is a feminist communist researcher and organizer from Beirut and Sour, as well as an urban planner and designer working with marginalized communities from slums to refugee camps. She has written for the newspaper Al-Akhbar, the magazine Al-Adab, and the journal Kohl on art, politics, women, refugee camps and the city. Nakhal is an elected member of the Central Committee member of the Lebanese Communist Party and organizes with female farmers and youth on issues of feminism, Palestine, unionizing, student movements, and gentrification.